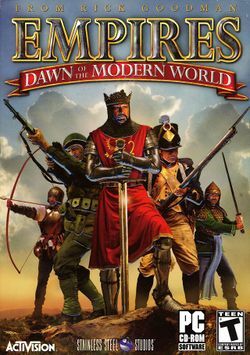 Empires: Dawn of the Modern World is a real-time strategy historically-based computer game released by Stainless Steel Studios in 2003. Rick Goodman was the main designer of the game, and his name itself helped it carry some weight. Although not extremely successful in sales, almost all critics and players hailed it as a good game. The game has many different aspects to its gameplay such as its civilizations, resources, buildings and classified projects. This page was last edited on 29 May 2016, at 18:55. This page has been accessed 30,036 times.